Spudnik Press's poster for its February 26 fundraiser, the Hashbrown. Lauren Anderson publishes artwork for Andy Roche at Spudnik Press. 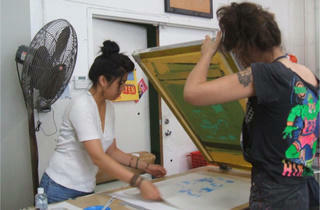 Anya Davidson prints a poster for Spudnik Press's third anniversary. 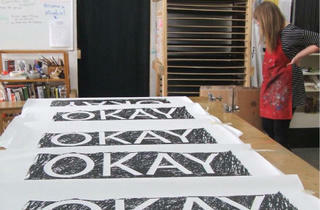 Erin Foley publishes artwork for Stephanie Brooks at Spudnik Press. 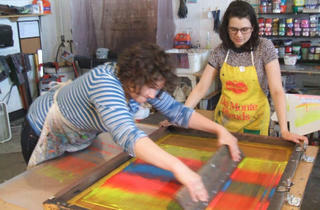 A woodblock class at Spudnik Press. Prints from the 10x10 project coordinated by Spudnik Press and Homeroom. 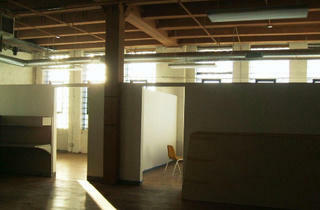 Spudnik Press's unfinished new studio at 1821 West Hubbard Street. 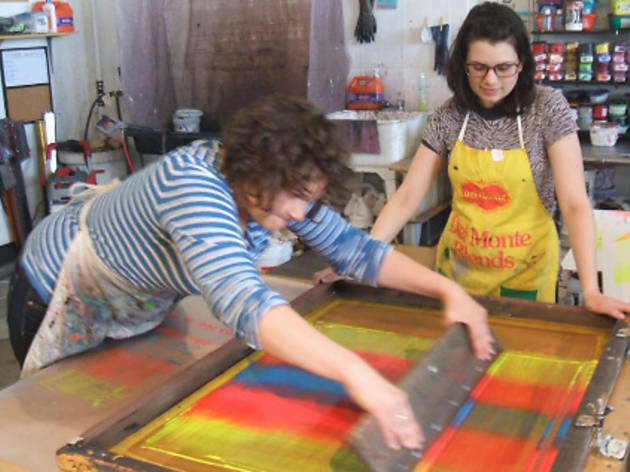 Printmaker Angee Lennard had a rude awakening after she graduated from the School of the Art Institute of Chicago in 2005. Without the access to presses and other equipment that they had enjoyed as students, “All of my peers were, like, ‘Oh, I’ll just draw,’ ” she recalls. 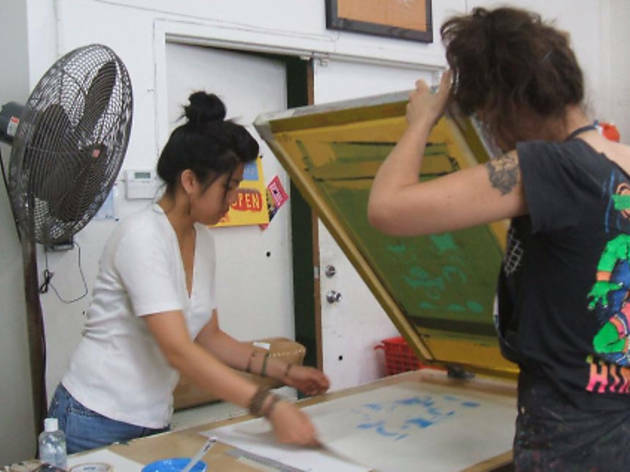 Instead of giving up her practice, Lennard founded Spudnik Press in her East Village apartment three and a half years ago, and immediately opened it to other printmakers. At first “it was barely functional,” she says. But visitors to the weekly open-studio night began contributing squeegees and other items, and within a year, Spudnik ran smoothly enough to offer classes. 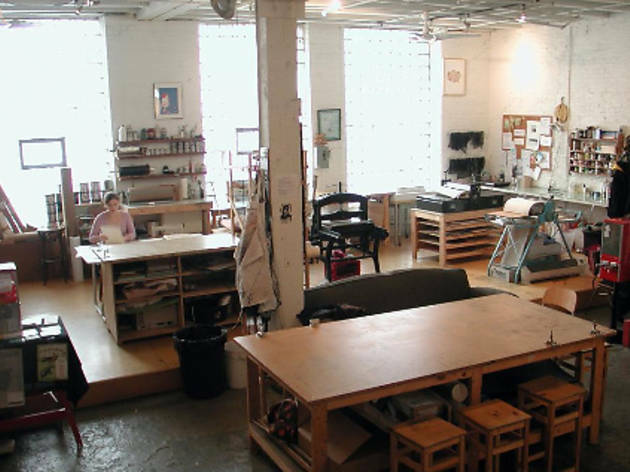 “Then it reached a point when too much was happening in an apartment,” Lennard explains, so in 2008 she moved the studio to 1821 West Hubbard Street, a former industrial building in West Town that houses several creative businesses. You might have spotted Spudnik elsewhere around town, however: making prints on the Orange Line during last August’s “Art on Track” exhibition or selling $1 artworks from its signature vending machine at the Renegade Craft Fair. In January, Spudnik and Chicago nonprofit Homeroom presented 10x10, a collaboration between local artists and bands that yielded a print exhibition at LivingRoom Gallery and a concert series at the Whistler in Logan Square. 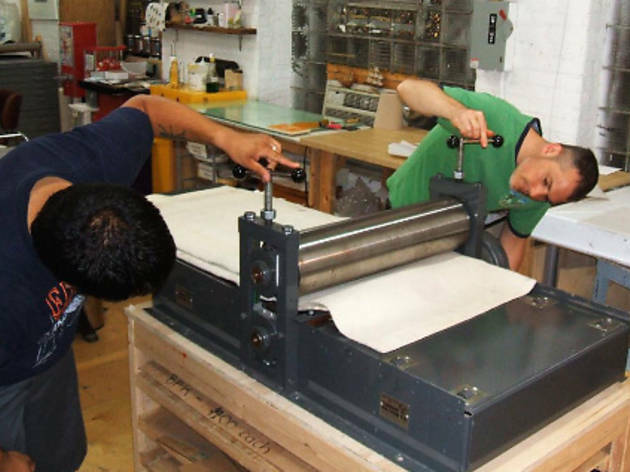 Spudnik, which wants to offer more classes as well as letterpress and offset capabilities, has outgrown its home for the second time. 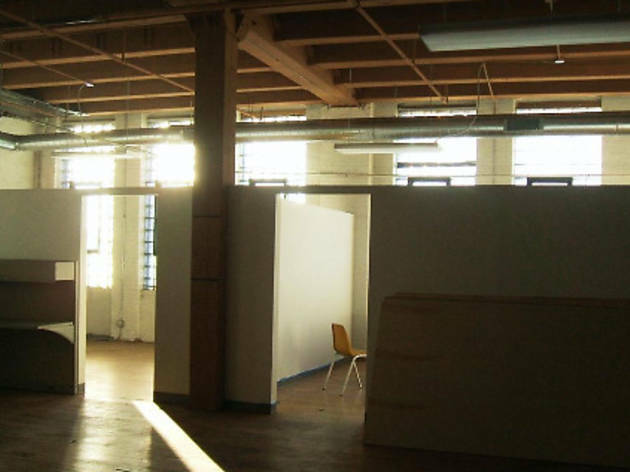 On Saturday 26, the press holds its annual fund-raiser, the Hashbrown, to help support its move to a 2,800-square-foot space down the hall from its current studio (pictured). 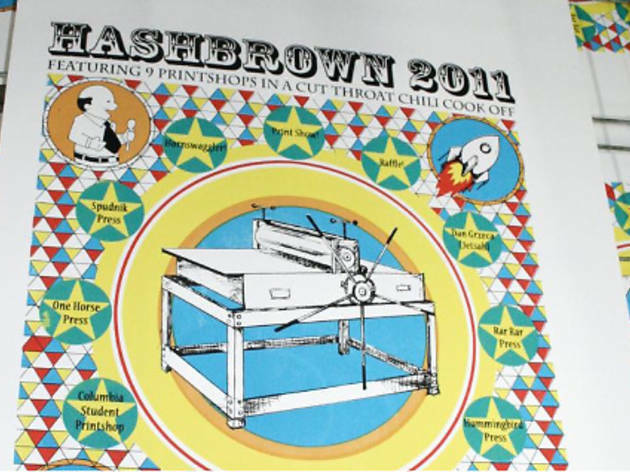 This year’s benefit takes the form of a chili cook-off, with contestants from Screwball Press, the Post Family and about ten other local studios. Spudnik probably will have to finish funding its expansion with a Kickstarter campaign, Lennard says. But the press—which has applied for tax-exempt nonprofit status—has implemented a few clever strategies to transcend the recession. For $22 ($15 for members, $10 for first-time visitors), artists can attend open studio, which now happens three times a week. 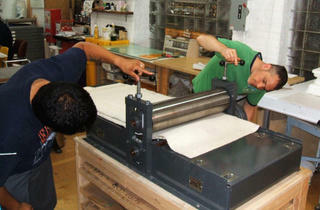 (“You can just drop in, as long as you know how to print well enough that you don’t harm the materials,” Lennard says. “There’s a monitor here to help.”) For $120 per month, “keyholders” get 24-hour access to Spudnik’s equipment. Classes cater to people “who don’t have an art background” as well as creative professionals who want to do something more tangible than computer-based work. 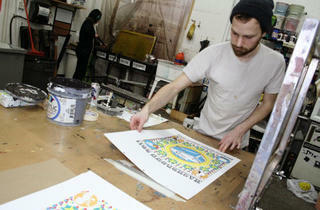 Lennard often produces prints for other artists as well. 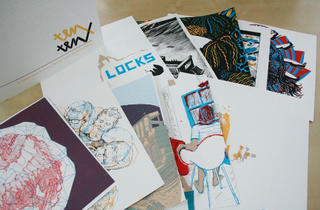 This year, Spudnik introduced a $250 subscription program available to 12 collectors. 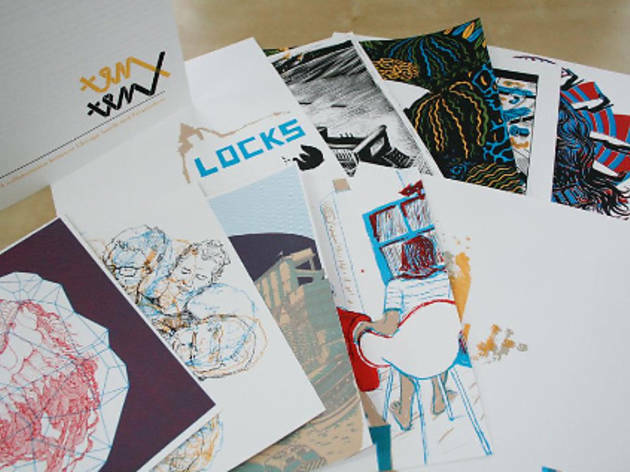 The 2011 package includes prints from the 10x10 project, a work by artist Regin Igloria, and a piece that illustrator Lilli Carré designed for filmmaker Joe Swanberg. Artists from Spudnik’s residency program will also contribute. 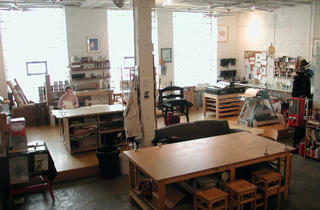 The program has supported several notable Chicago artists, including Miller & Shellabarger, Paul Nudd and Onsmith, and Carré. 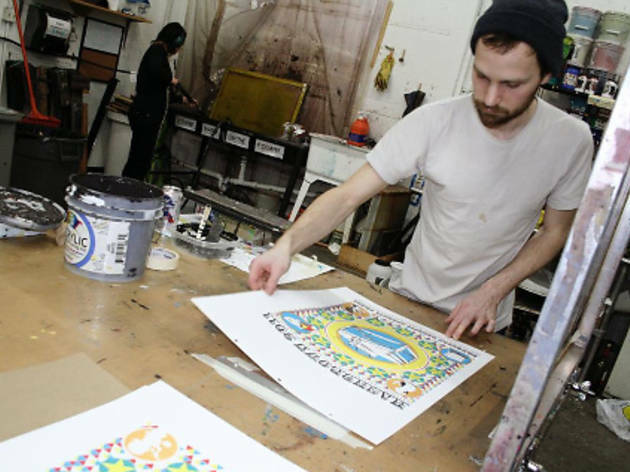 Lennard started the residency program to make printing at Spudnik as accessible as possible. “Even though it’s cheap, that’s not the same as free,” she laments. Sales of residents’ work fund future Spudnik artists. Lennard hopes the subscription program and the Hashbrown keep raising awareness of what the press does. 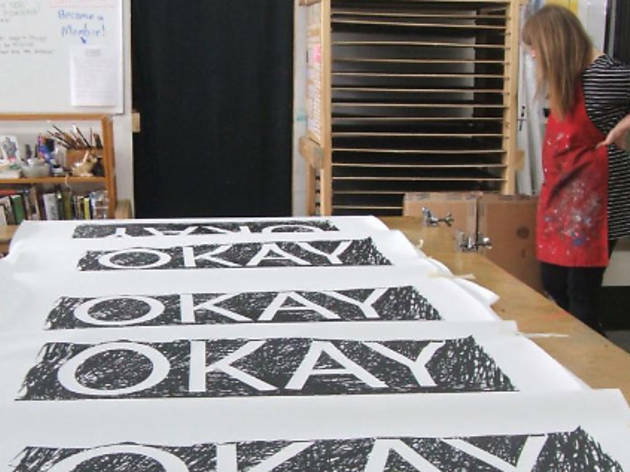 Even among artists, she notices, “there are a lot of misconceptions about printmaking.” Though Nudd had worked in the medium before his residency, he says the experience inspired him to take more classes at Spudnik and Columbia College’s Anchor Graphics. 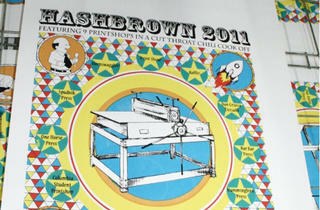 Spudnik Press hosts the Hashbrown Chili Cook-Off Saturday 26.